Would you like to join our volunteer programme and work with LGBTI+ young people? Give a few hours of your time to help make a massive difference. 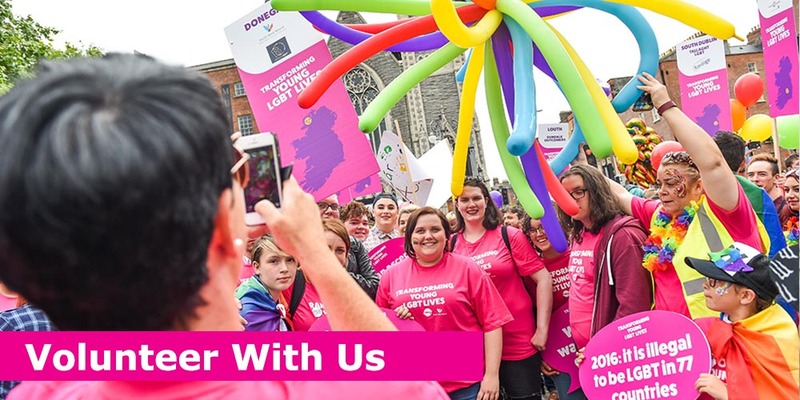 We will be looking for enthusiastic, fun and caring individuals to volunteer with our LGBTI+ youth services in Dublin in 2019. We provide volunteer training and our team will work alongside you to offer support and guidance. Help us changes lives and create a brighter future for LGBTI+ young people. Thanks for your interest in volunteering with BeLonG To Youth Services. We are not currently recruiting any volunteers. Please check back soon for upcoming volunteer opportunities. Volunteering will help you gain skills that you can use in all aspects of your life and it’s also a good way to use your existing skills to help others. Volunteering also gives you experience that you can build on for your CV. Gain experience facilitating groups, learn basic youth work skills, and share your skills with young people in a fun and relaxed youth space. Be part of an organisation that enacts social change for young LGBTI+ people, and give something back to the community.